On reading Pather Panchali one cannot help feeling that Bibhuti Bhushan’s construction of Apu has given Ray an understanding of child psychology. Most importantly, Ray imbibed from Pather Panchali, the leit motif of his body of films. This recurring motif is Apu. We encounter Apu not only in Apu trilogy, but also in Pratidwandhi, Seemabaddha and his last film Agantuk. “Whenever Apu stands by the window, he has visions of Bishalakshi Thakur, the radiant goddess in a red saree, adorning a flower garland and a flower bracelet. That was an excerpt from Bibhuti Bhushan Bandyopadhyay’s Pather Panchali, a book whose cinematic adaptation made Satyajit Ray famous and catapulted Indian cinema to the league of world cinema. Satyajit Ray lived with Pather Panchali for more than two years – first to illustrate the abridged version of the novel for children and then contemplating making a film on the novel. In these years, Ray absorbed many qualities of the novel, qualities that have defined Ray the filmmaker – a humanist with a sharp eye for details, a filmmaker who could see the universe in the convexity of a dew drop and could construct a complex world with everyday insignificant details. Last but not the least, Ray was a filmmaker with a profound understanding of child psychology. Ray’s children behave like children and speak like children, unlike most children in mainstream Indian cinema. On reading Pather Panchali one cannot help feeling that Bibhuti Bhushan’s construction of Apu has given Ray an understanding of child psychology. Most importantly, Ray imbibed from Pather Panchali, the leit motif of his body of films. This recurring motif is Apu. We encounter Apu not only in Apu trilogy, but also in Pratidwandhi, Seemabaddha and his last film Agantuk. Apu gathers his mother’s sparse belongings into a bundle and moves on to take the train to the city. Like Bibhuti Bhushan’s Apu, Ray’s Apu is untouched by the worldliness. He is incorruptible, pure, innocent and a little aloof. But unlike Bibhuti Bhushan’s Apu, Ray’s Apu is more forward looking, more touched by modernity. In Pather Panchali we see him mesmerized by the train – a metallic monster cutting its way through the flaky white soft landscape of the kash bon. In Apu Trilogy, the train is the harbinger of modernity, of change, of a way of life different from the cesspool of Apu’s Nishchindipur. 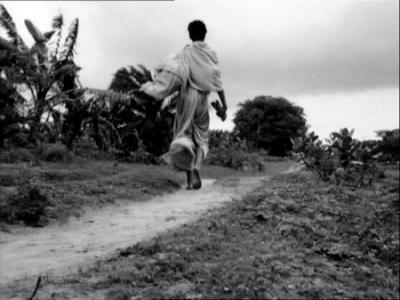 In the last scene of Aparajito we see Apu turning his back to the village forever. With his mother’s death, his last tenuous link with his pastoral home is severed and he does not have the patience to stay back and complete his mother’s last rites at the place where she breathed her last. Apu gathers his mother’s sparse belongings into a bundle and moves on to take the train to the city. His grand uncle’s arm rises in blessing. Apu does not look back and acknowledge. Satyajit Ray has written emphatically in his book Our Films Their Films, that he is a city boy. He is not lured by the idyllic romanticism of the village. He did not complete his studies in Shantiniketan. He came back to Calcutta to catch up with his western music and Hollywood films. This urban-philia has got rubbed off in Ray’s construction of Apu. Ray’s Apu has become a symbol of a newly independent nation’s march towards modernization. Bibhuti Bhushan’s Apu, on the other hand, is torn between the pull of the outer world and the pull of Nishchindipur. For him Nishchindipur is his microcosm – the place where he spent his wonder years, where he learnt his letters and had his first stirrings of manhood. In Nishchindipur, Apu spent hours sitting under a tree or perched on a fishing scaffold and reading books from his neighbour’s library. While the gentle breeze of Nishchindipur nurtured his body, his mind raced to the snow-capped mountain or the dreary desert. In Aparajito the book as well as the film, Apu insists on joining school and quench his thirst for knowledge through the rigour of academics. In Bibhuti Bhushan’s Aparajito, in between his school hours, Apu continues to perform his task as the village priest. But in Ray’s Apu Trilogy on the other hand, we never see Apu performing his priestly rites. As a matter of fact, we do not see his father performing these rites either, even though we know that priesthood is Harihar’s livelihood. Perhaps Ray’s aversion for rituals has been reflected in this absence. Apu finally wins the confidence of his son and shoulders his responsibility. All the films of the trilogy end in a journey. In Pather Panchali, the family uproots itself from the ancestral home and moves on in search of greener pastures. In Aparajito, Apu severes his ties with the pastoral past and in Apur Sansar, Apu finally wins the confidence of his son and shoulders his responsibility. Father and son move on towards an unknown destiny. 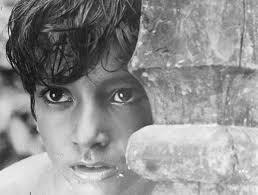 Ray’s treatment of time in Apu trilogy is linear – like an unwound snake, its energy unleashed. Apu moves on in life. After Apu Trilogy, Ray’s Apu recurs in several later films, each time in a different name, but having the same qualities of being untouched by the complexities of life, unvanquished by its challenges. So Apu lived on even after its original creator Bibhuti Bhushan died in 1950. But did Apu die a peaceful death on 23rd April 1991? Pramathanath Bishi writes that Apu is an eternal child. Apu is not a being of flesh and blood. Apu is an idea – not an apparition, but a luminous spirit – a spark from the flame of creation that had fallen on the pristine greenery of Nishchindipur many years back. Twenty two years after Satyajit Ray’s death, Kaushik Ganguli brought the luminous spirit out of the bottle in his film Apur Panchali. 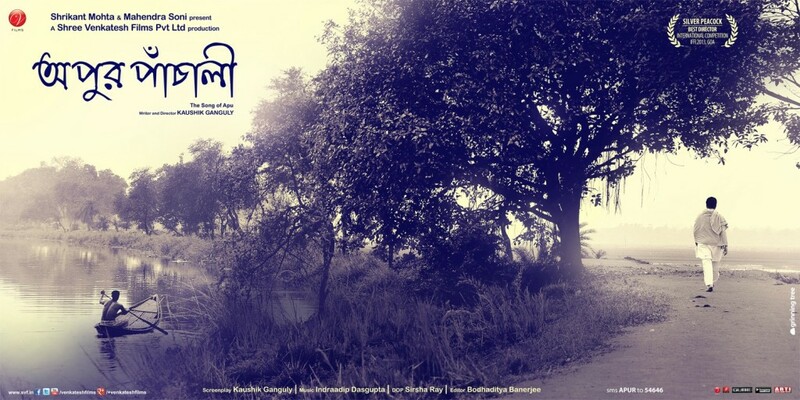 Apur Panchali begins in a documentary style, with the protagonist Arka, an SRFTI student, looking for the guy who had played the role of Apu in Pather Panchali. The reason for the search is to deliver a letter from the Government of Germany, who have chosen Apu to be the most celebrated child character in world cinema. Arka finds Apu in 32/27 Chandi Ghosh Road, a small house in a by-lane of south Calcutta, recluse and slightly bitter with life. Just as Apu’s eyes were opened by Durga through the tear in the bed sheet, Subir Banerjee’s gaze was turned outer world by Arka’s knock at the door – as if it was a cue to the spectator that Apu’s new journey is about to begin. If Ray absorbed the qualities of Apu during his two years of companionship with Pather Panchali, how much of Apu was brushed off on the tender shoulders of Subir Banerjee during the four years spent on the little road? The innocent looking child that Bijoya Ray (Satyajit Ray’s wife) had spotted on the terrace of her neighbours, is now a weather beaten, ‘vanquished?’ widower. Above everything else, he is strongly resentful of being called Apu. At one level, Apur Panchali is about how Apu’s fate was transferred on his impersonator Subir Banerjee. Like Apu, Subir has a friend and confidant in Moloy, who is instrumental in sealing Subir’s wedlock, like Apu, Subir is woken up from his sleep/ reverie when his father’s condition gets critical and Subir’s mother’s stoic stance in keeping the family going is reminiscent of Sarbojoya’s daily struggle in keeping her hearth warm. Apu’s wife Aparna had died of childbirth, leaving behind Kajol whom Apu did not want to face for five years. Subir’s wife died of grief having lost her child in childbirth. Both Apu and Subir were grieved by their wives’ death and both withdrew from the worldly life. Apu left Kolkata and took up a job at a colliery. He destroyed the manuscript of the book he was writing. Subir stayed on in Kolkata and withdrew into a shell. He took voluntary retirement and thrived on his meager pension and paltry house rent. Through much of the second half of the film, we see Arka gradually transforming into Subir’s son. First Arka brings his father’s clothes for Subir. Then they become close buddies on the night they drink together and Arka decides to spend the night in Subir’s home. Finally, the airport duty officer mistakes them for father and son. They do not deny the relationship imposed on them. In the penultimate scene of the film we see ‘father and son’ – Apu and Kajol, climbing the escalator on their way to board the aircraft. For Apu it would be his first plane journey. For Kajol it would be his first plane journey in business class. The plane has replaced the train of Apu trilogy. But llike Apu trilogy, the arrow of time continues to point forward. In the last scene of Apur Panchali, Subir finally says ‘yes’ to a little boy’s query whether he is Apu. Subir is finally at peace with the Apu in him. As the little procession with the Durga idol passes him, he continues his journey along the dust track of the village. It is an inward journey, celebrating the spirit of the unvanquished. Thus, in skilfully juxtaposing two journeys – the outward journey to Germany and the inward journey to ‘the cave of one’s heart’, Kaushik Ganguly has brought out the dual nature of time. While time is linear and forward looking, it is also coiled to an eternity. The eternal child Apu dances on this coil. Apu is the recurring motif not only of Ray, but of Indian cinema. Let us wait for his reincarnation. Subha Das Mollick is a media teacher and a documentary filmmaker. She has made more than 50 documentary films on a variety of subjects, most of which have been aired on the national television. She had been the head of the Film Studies and Mass Communication Deptt. at the St. Xavier's College, Kolkata. Great job, Subha. Thanks for sharing . . .
What a beautiful write-up Subhadi. “To remember Satyajit Ray is to remember not only a friend for he was very cordial, but also a guru especially in matters of culture. From his first feature film, Pather Panchali 1955, until his last one, Agantuk 1991, he made about 36 movies. But we can say that, like any great writer, in all his life he made only one movie, from one movie to the next. 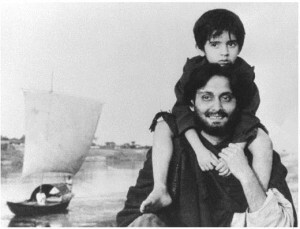 In Manikda’s career as a filmmaker Apu grew from film to film, from Pather Panchali until we could see him, as an adult, in the hero of Agantuk, whose name was Manomohan Mitra which means ‘the lovely friend’, that is, one who is lovable and loving.